Not long ago I updated my Corel photo editing software from x3 to x8. The difference has been bigger than expected but in a good way. I am really enjoying the typography element I don't think x3 had in its features. Also, the gradients and patterns are better-or at least there are a few more than before anyhow. In short, I am glad I bought it especially since I got it at a really awesome price. It does seem to crash a lot if I try to do too much too quickly but so long as I try to pace myself it doesn't crash. Besides that it has made me aware of the importance of saving my work if I want to avoid starting over. In word processing it would be second nature but photo editing and graphic design I guess I was slow to catch on. One would think I would save my work automatically but I didn't expect the darn program to keep crashing on me whenever I tried to do a lot of actions quickly. Other than my new software I've been having fun with I haven't done much with my stores lately. I guess the humidity (it's been humid since last month here) has just zapped my energy. But I did update all my store headers and most of the signs for my shops. I also took the liberty of taking any older designs of mine that were not getting much attention and 'spruced' them up a bit. Not sure it will help any but I figured since they were not getting a lot of viewing they might benefit from the changes. Since there was a gift wrapping paper sale on a few weeks ago I also made a few new designs for gift wrap. None sold yet but I will give them more time before contemplating my next step of action with them. The idea of more is better is not true in my experience. It usually just means a lot of stuff gets skipped over. So I like to keep my product count down to a certain amount that won't overwhelm potential buyers. It does take away some of the spontaneity having to consider if a new design will mean I have to delete another to even things out (i.e. one design in one design out); but all in all it is likely better than adding more designs continually without consideration of total number of products in my shop. On another note, I purchased two throw pillows from my shop to see how they would be. The pillow itself is nice but my design had some red marks on it that I never noticed before ordering. So I cleaned up the image some and made another version of the design on a pillow. Both the design with the red spots and the cleaned up one are available. I would have deleted the one with the spots but then I thought it would probably delete my review for the pillows I ordered. My guess is the spots were a by-product of the image being an original vintage image that had not been altered. Unfortunately I never thought about zooming in on the image to 100% because I didn't notice anything from its smaller screen view. Now I realise it was naive but I know better now and won't make the same mistake. 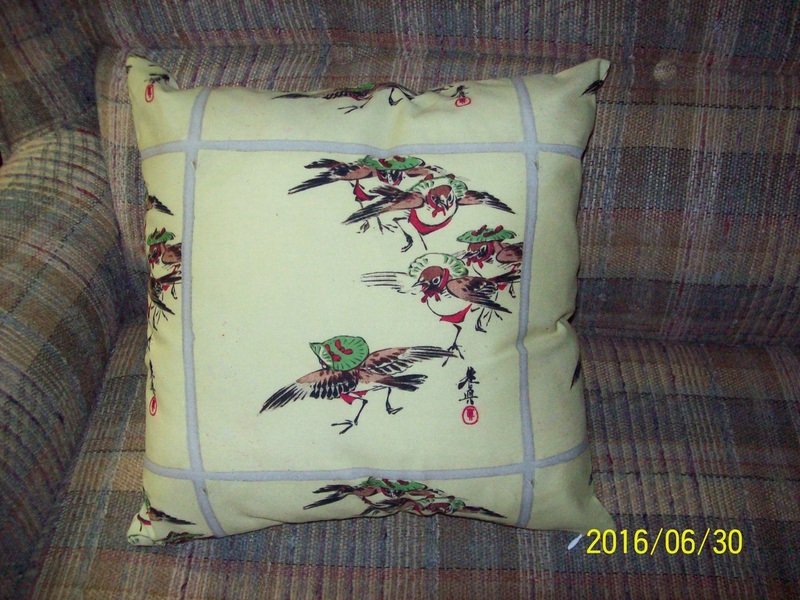 ​Here is a photo of the pillow I bought and designed. I bought two and am somewhat regretful I didn't just try out one. Oh well. My stores on Zazzle.com have been getting more of my attention lately because I have fewer products in my shops; thus I feel freer to add products and quit deleting my designs. It's thoroughly disheartening to delete the number of products I have over the past 7 months or so. I never expected I would have to cut so many designs but I can understand the necessity of it. Not many people want to peruse 10 000+ products even if they want to buy something. The fewer items one has the more likely all will have the opportunity to be at least viewed at some point. So I have been looking over my designs in all my shops assessing them to determine if I can improve them. If I alter them I can republish them anew and delete the old one if it did not have success. That gives me an opportunity to at least design without feeling like I have no room for anything beyond what is already in my shops. ​I am going to set up another site for my .com Zazzle stores because I think it will give me more space to show my designs. Once I have it set up I will give the details on here. I started creating my own fractals and geometric art in December 2015. So far it isn't all that successful on Zazzle but I won't give in yet. People seem to still prefer the Public Domain art used in my designs over mine but maybe that will change. I did delete a lot of the PD art designs to allow mine a chance to be seen. Also, I changed the name of my store from FunFabulousFractals to GeometricFractalDesigns4U. Unfortunately the URL is under the old name still but it is the new name when you click on my products. Here are some things from my fractal and geometric design line. It's a mix of PD art and my own on the products shown. The shoes are PD art and business card features a PD rose. The mug and mouse are my art. All designs are my own but art used in designs is as I stated. Well it's been a while since I updated here because I felt overwhelmed during the holiday season that starts to really ramp up in November. Basically I was trying to keep on top of putting products in my shops but keep the overall number to a minimum. Since Zazzle introduced a ranking system for designers (only the designer sees it) it has become a constant struggle to find balance between 'decluttering' my shops, adding products, and promotion on social media. Being a rather modest type of person I find it difficult to promote my products a great deal but I do try. It just feels a bit like I am pushing a boulder up a mountain! I'd much rather let people find my products on their own but I know with so many other designers on Zazzle it would be very unlikely people would see my things without a bit of help (promotion). So I do what I can and hope I do not overdo my efforts. ​I took a bit of a break in February when I tried to put a new operating system on an old laptop I own ; not having any experience with such a task I found myself needing more time than I had anticipated. Soon I realised I was rather obsessed with getting my laptop to be better than ever yet knowing in my mind that was wishful thinking. I did get the operating system on and found the necessary drivers but I remain unable to get my Windows Updates aside from the handful I got when I first put the OS on my laptop. Since then I have been unable to get updates even though I have the proper settings and dll files. I read somewhere about 'dll Hell' and immediately knew what they meant because I had loads of dll issues before I did a repair instillation of my new OS. Why do different programmes have to share a common dll? If you delete something you think you don't need and it shared a dll with something you do need well you're not going to be a happy camper. That's what happened with my first install of the new OS and I was running out of ideas on how to fix the problem myself (being quite the novice) so I did a repair install. That helped but I still have issues with Windows Update. Anyhow, I am using my laptop with Windows 10 and leaving the Windows 7 laptop alone because I am liable to pull all my hair out if I have to work on it anytime soon. Right, well back to my Zazzle products and shops. On the .ca Zazzle site I have two shops and one of my shops fell from a 5 to a 4 (on a scale of 0-10) and the other is still at 5. On the .com Zazzle site I have three shops and two shops dropped from 5 to 4 and one stayed a 5. So I am a bit upset that my rank dropped, however I know it is likely because I ignored the shops that dropped for over a month. I do hope I can get them back to a 5 though because I hate to think I am not performing as well as I could. The issue at hand is do I delete items or promote like crazy on social media and my blogs or both? I'm leaning toward promotion because I have already deleted thousands of products from my shops and don't want to keep doing that. It is very demotivating for me. ​Okay, I will be back sooner with updates on my designs and shops. My LovelyDesigns4U store on Zazzle went from a 4 to a 5 on the 0-10 ranking scale introduced recently. This is after deleting many (thousands) of my less popular products that never had any views by customers. For a while it felt disheartening because I had to remove so much from my store and I never saw improvement in my rank-until yesterday! I guess my efforts paid off a little bit because getting your rank to improve is difficult without lots of sales. Honestly, the ranking system is a good idea; it got me to see my store needed improvement. If the numbers had not been introduced maybe I would have fewer sales, it's hard to tell so early on though what will happen. I am open to making changes where needed if it helps me have better designs available. Business is not really my forte but I am learning a little of what it takes to market my designs, including what people are interested in. I will pay attention to what people have bought and what has gone ignored. If I were more business minded I likely would have clued in quicker than over two years after opening my shop! My other shop on Zazzle (NewAgeInspiration) is still a 4 but I did not start focusing on it until I had finished my LovelyDesigns4U shop so hopefully it will improve in rank too. I designed this dog bed recently and really like it so wanted to showcase it in its own post. The background colour is turquoise but you can change it to another colour you like better. It's been quite awhile since I updated my blog so I am sure there's work to do if I want to have readers! First off, I have to apologise for not blogging more regularly (or at all!) but Zazzle has been changing their site; which lead to changes for designers requiring us to give our shops a 'facelift'. This meant devoting lots of time to simply having my shop presentable so I could meet the new standards. We are now given a number rank from 0 to 10 based on how we perform. I must say it gives one some incentive for performing if you're at all competitive. But I find the ranking system (which is not visible to customers) somewhat discouraging too because it rewards you for selling more products. Yet I am not a salesperson first-I consider myself to be a designer before a salesperson. So now I have to 'weed out' loads of products from my shops that never had a viewing. At first this was not so difficult because I just deleted stuff I didn't care about but my rank never improved. That lead to more product deletions so people could see the most popular stuff but I have yet to see any rank improvement. It's all a bit disheartening because I hate focusing so much of my effort on marketing. None of this would bother me but the higher your rank the better chance you have of getting a prime spot in the Zazzle Marketplace search results. If my rank is below 6 (which it is) I have to devote more time to marketing. Otherwise my products end up on a page number nobody ever goes to (usually people go a max of 13 pages or 20 if very interested). Anyone with products on pages past the first 1-20 are out of luck in terms of having Zazzle promote your designs. All this means I am less focused on designing lately and more on trying to climb my way up the ranks from a 4 to at least a 6 so I can have my stuff viewable in Zazzle search results. I don't enjoy having to delete products (so far I have deleted thousands from my main site and hundreds from my smaller shops). But it's the only way to improve rank since it allows customers a chance to see more of your products if there's only a few hundred items instead of tens of thousands. Ultimately my goal is to have great designs and fewer products so that what I have is more likely to be viewed (and bought!). Thanks for reading.